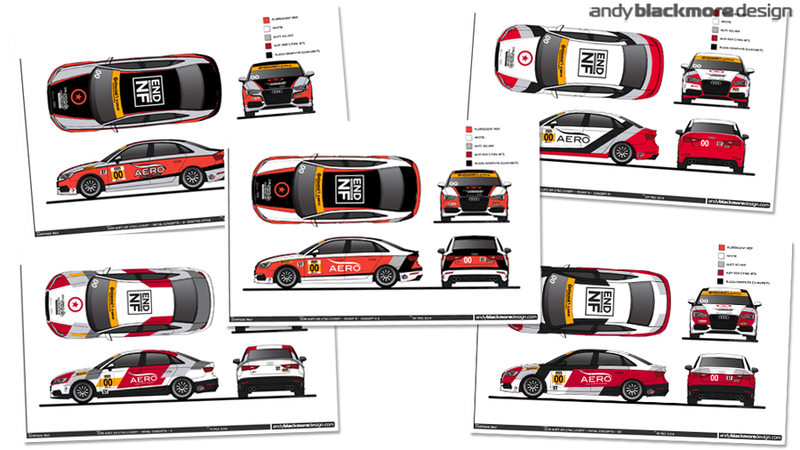 I was initially commissioned by C360R at the end of 2014 to design a new livery for their new Audi S3 sedan program. C360R, based in Canada, have worked their way up various series to be a leading team in the IMSA Continental Tires SportsCar Challenge with a variety of Japanese chassis, all sporting a bright ‘Rocket Orange’ livery design just as Marlboro, McLaren and Penske had back in the day. 2015 was a new chapter with the German marque, so I worked on some new designs with team owner and leading Creative Director, Karl Thomson. We would also be using AERO Paint film which really enhance a vehicle livery. The film appears similar to a vinyl wrap, but its actually a film of paint, complete with lacquer. This gives the colors more depth, allows usage of different material finishes and is much tougher and lighter than vinyl. The brief called for a new look with married an Audi Sport appearance with C360R elements. I took a variety of approach to this as you can see in these initial concepts. Similar to Audi’s own R8 LMS ‘R18 inspired’ liveries, the design looked more disjointed than on a GT car, so we developed ideas around the heritage angle. I prefer to create a modern take (as per my Speedhunters Scion Tuner Challenge livery) on any heritage based livery rather than just replicating what was done before. One decision which went back and forth was to including the graphic over the D-pillar. We initially decided on the more conservative approach for the Daytona release. 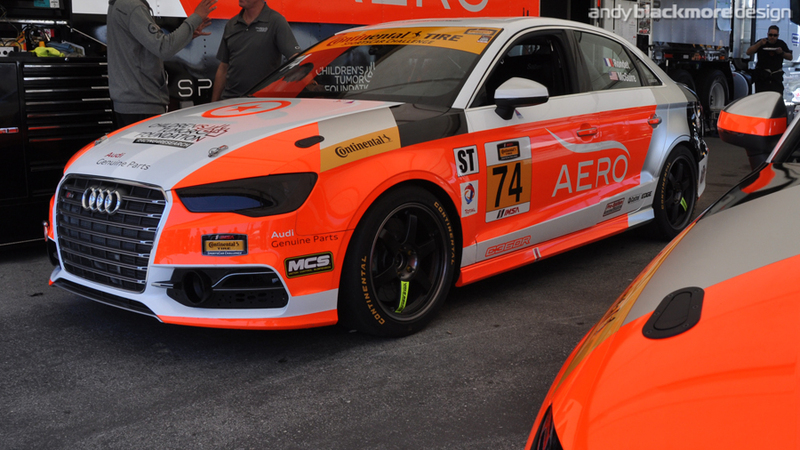 By Sebring, the team, reverted back to the design with the Audi stripes extended across the D-pillar and it looks better for it. 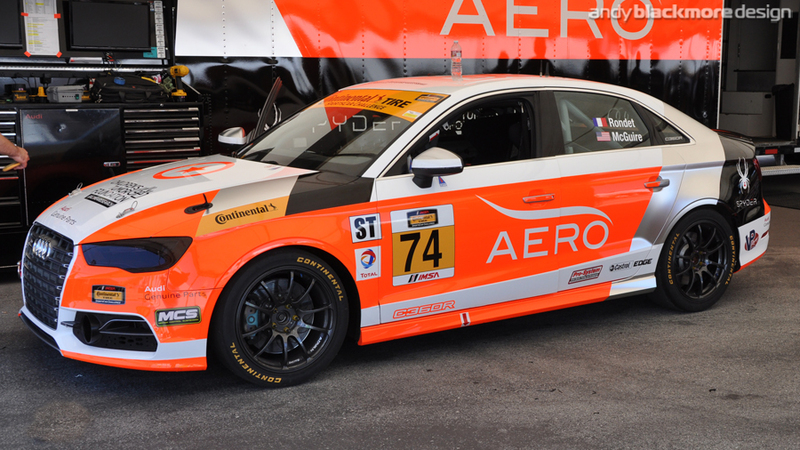 During this time, AERO were also able to develop their paint film with the ‘Rocket Orange’ look. 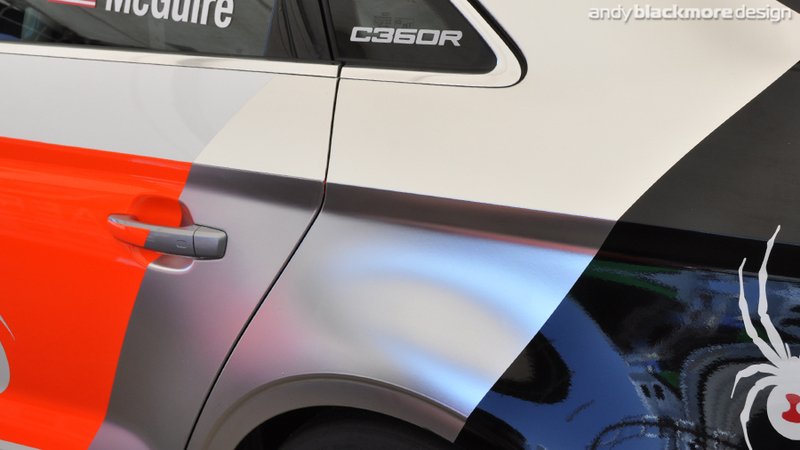 AERO had also introduced a new Satin Chrome paint film, “Liquid Steel” which gives amazing reflection properties. Both of these new vinyls have since been used on the Michael Shank Racing Ligier HPD in the IMSA Series. Back in time, at my days at McLaren, the rocket red paint consisted of 7+ coats to create the vibrant fluorescent look. AERO were able to develop the same vibrant color in a film. This image also shows I incorporated the mandatory series tyre branding into the design. 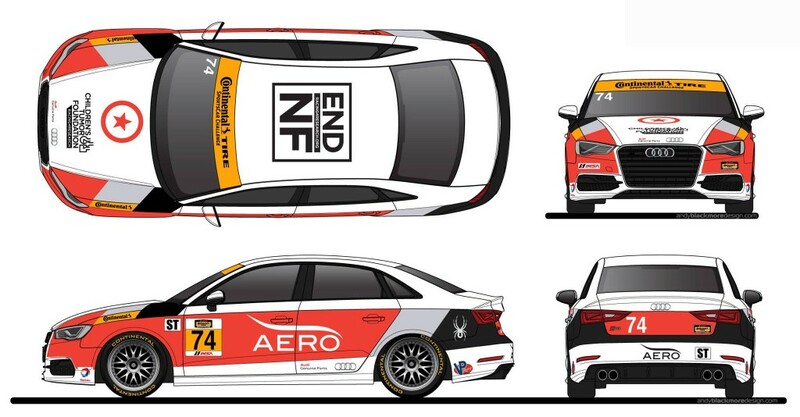 Following the debut of the Audi S3, the team worked behind the scenes to create a TUDOR United SportsCar Championship program in the GTD class. As a successful creative director, Karl started work on transferring the livery to an Audi R8 LMS livery. As it happened I was at Laguna Seca during testing, a few days before the official announcement, so I was called upon to develop the design and produce a side elevation while on location, ready for the press announcement later that week. The initial design closely follows the Audi S3. The final design looks very similar. 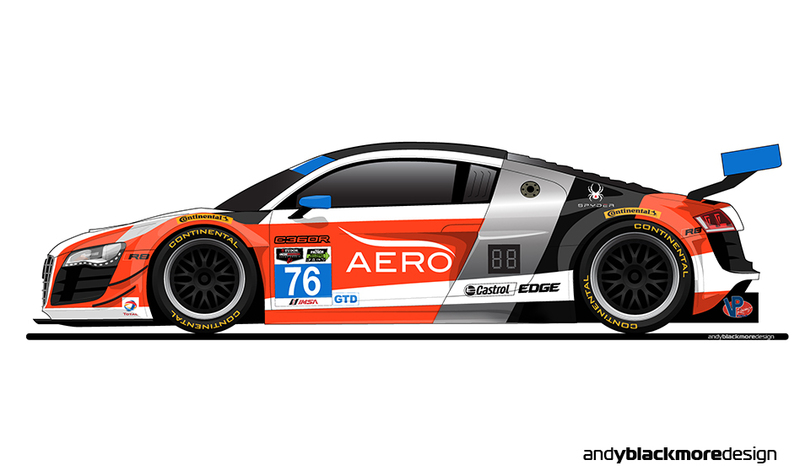 Unfortunately, the donor car has their IMSA number panel on the door, which necessitates the AERO branding to be moved up. This in turn requires the Rocket Orange to extend up the door, but the design still holds together. This video from IMSA previews the car, prior to their Lime Rock Park debut. Cool of IMSA to call it eye-catching! As before the livery uses this cool Liquid Steel Paint film for the Silver accents with the Rocket Orange wrapping around the headlamps and grille of the racer. 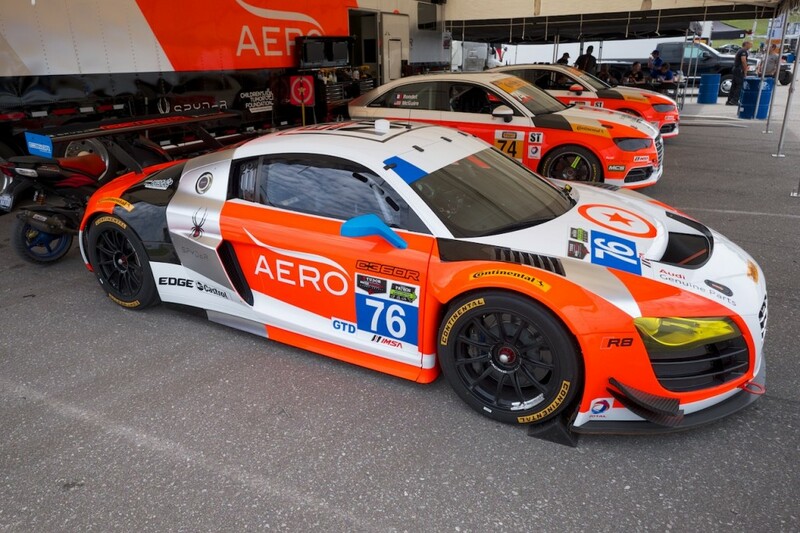 The Audi R8 LMS will run a limited program in the 2015 TUDOR United SportsCar Championship, starting with this weekend’s round at Lime Rock Park. 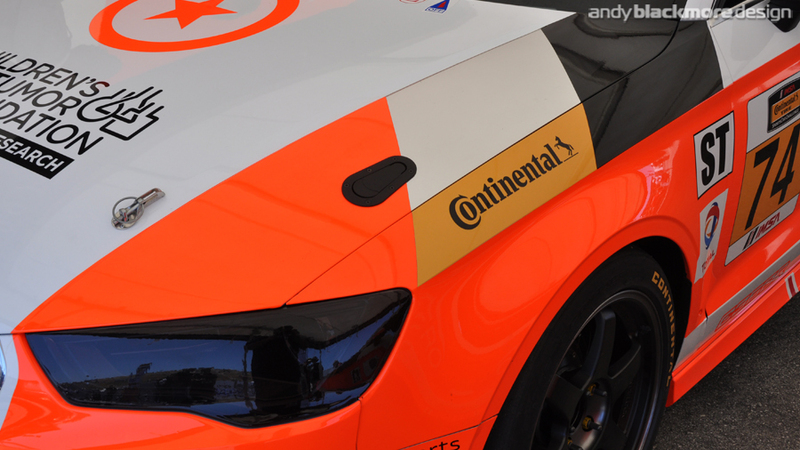 The Audi S3 will continue to be developed in the Continental SportsCar Challenge. 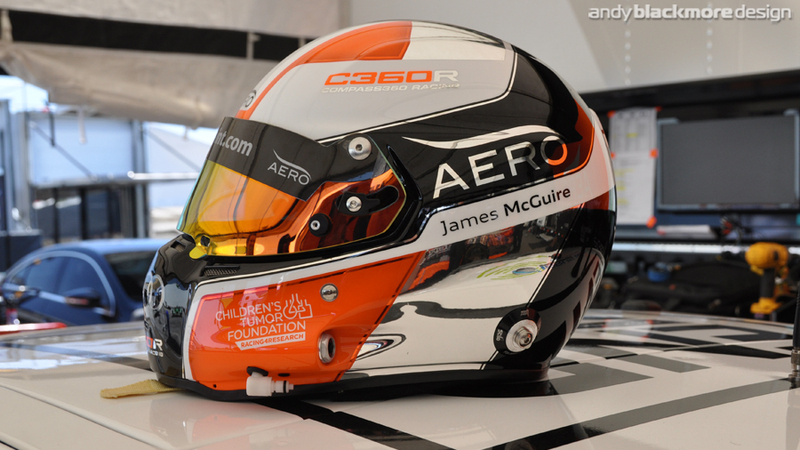 As a post script, AERO CEO, Jim (James) McGuire is one of the drivers in the S3, with one of my friends Nico Rondet. Jim commissioned me to create a new helmet design based on the S3 livery. The helmet was painted by Censport Graphics.